Peter Cooper Dusts Off His Cameras And Visits The Historic Airfield Of Duxford. The Recent Arrival Of The Cessna Cj1, Zk-Tbm, For Pacific Jets Heralded The First Full-Time Bizjet Charter Service Seen In New Zealand. But, Far From Being Accessible Only To The Rich And Famous, This Service Is Well Within The Reach Of The Average Flyer. Rob Neil Sampled This Enlightened Way To Travel And Met The Men Behind The New Venture. Despite The Advances In Aviation Since Kingsford-Smith'S Famous 1928 Flight, A Flight Across The Pacific In A Single-Engine Aircraft Remains One Of The Most Challenging A Pilot Can Make. 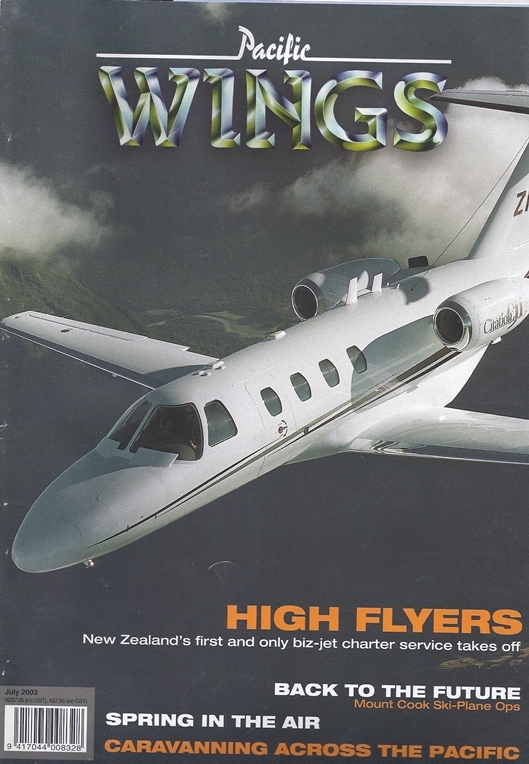 Peter Hirst Describes The Highs And Lows Of His Ferry Flight Of Air Safaris' Cessna 298B Grand Caravan From Las Vegas To Lake Tekapo. John Nicolson Discovers That Although A Lot Of Snow Has Fallen Since Harry Wigley'S Pioneering Flights To The Tasman Glacier, Ski-Plane Ops Onto Mt Cook'S Snowfields Remains As Strong As Ever.